This is a companion to the analysis of the bulk read coverage of endogenous genes. It must be run first to prepare the bam files. 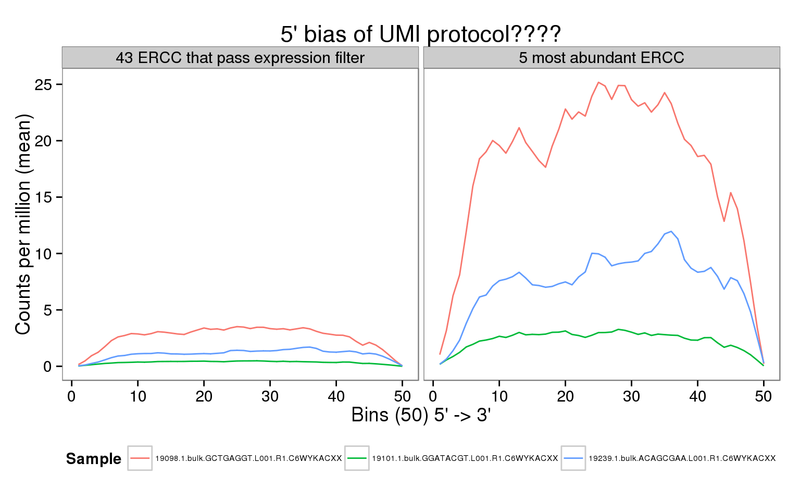 We do not observe the expected 5’ bias of the UMI protocol for the ERCC spike-ins. Using the bulk reads, we observe a uniform coverage across the ERCC gene body and more pronounced differences between individuals compared to the single cell molecules or reads. Using the same bulk lane samples from the analysis of the bulk read coverage of endogenous genes.